What is the best way to reach Caribbean Charm with questions. Send an email to customerservice@caribbeancharm.com or call Customer Service at (toll free) 1-888-880-4443, or 1-860-430-9909. What are the hours of operations. Tuesday - Saturday 10:30am - 6:00pm EST. However, during Holidays and busy seasons these hour are extended accordingly. Shipping cost is based on weight of product, location of where product is being shipped to, and the shipping carrier selected. You can select shipping for FedEx ground, home ground, express, USPS priority mail and UPS ground. Caribbean Charm offers a shipping calculator prior to check on the View Cart page. By simply inputting your zip code and hitting GO you will see a drop down box which lists all your shipping choices, along with the cost of shipping. Go to Shipping calculator ›› Please note; the shipping calculator cost is based on what products you are purchasing and where you live. Can I track an order after it is shipped? Yes, when your order is shipped you will be sent a tracking number via email. Also, when you check out if you sign up for an account, you can track your order via your account. If shipped UPS go to: www.UPS.com and input your tracking number. If shipped USPS priority mail go to: USPS tracking and input your tracking number. How do I request a refund for a return? for a return authorization number. All claims must be made 10 days upon delivery. Go to Return Policy› for a detailed explanation of Caribbean Charm's return policies. I would like to place my order over the phone is that OK? Yes, Caribbean Charm welcomes ALL phone orders. Please contact Caribbean Charm at (toll free) 1(888)880-4443 or 1-860-430-9909 and speak to a friendly customer service representative. I ordered a personalized product and need to know how long it will take to be shipped? All personalization is processed at Caribbean Charm and there is an estimated turn around time of 1 to 8 business day(s) to complete the personalization during the Normal Business season. Once personalization is completed it will then go to shipping. There could be a 1 to 2 day shipping turnaround. For example, if an item has been personalized and goes to shipping later in the day, it will NOT ship out until next (business) day - due to the fact the shipping carrier has already picked up for the day. If you have an urgent personalized order please contact Caribbean Charm and they will do their best to accommodate your needs. If necessary RUSH your order. During the Holiday Season this time may be extended to 15 business days. if you have any questions for a delivery date please contact Caribbean Charm and a friendly associate will help confirm the exact date. Please select EXPRESS SHIPPING IF YOU WOULD LIKE TO HAVE YOUR ORDER RUSHED! I ordered a personalized product, what if is NOT personalized correctly? Caribbean Charm focuses on special personalization and makes every effort to confirm you personalization is processed correctly. However, on occasion (we are all human) an error might be made. If Caribbean Charm makes a personalization error they will replace your order to be correct. Please send an email to customerservice@caribbeancharm.com for a Return Authorization number to have a return shipping label (if applicable) sent to you. Once your item has been returned, Caribbean Charm will redo your order and ship you the correct order. I love one of your products and would like it personalized a certain way. The web site does not offer this. Caribbean Charm focuses on special personalization. Please contact them and let them know what you would like to have personalized - if they can do it - they will for youl! I'm sending a gift to a special person and want to let them know with a gift note. Can this be done? 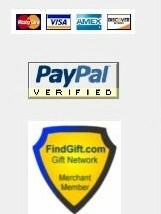 Yes, at check out there will be place to add a gift note. Caribbean Charm currently offers complimentary gift notes/cards created and printed onto a note card paper. I would like to have my order gift wrapped? Currently, Caribbean Charm's products offer gift wrap - wrapped in their special Silver Foil and accented with their signature 'curly ribbon". I live near Caribbean Charm's location - can I pick up my order? Yes, Caribbean Charm offers local pick up. Upon check out you will be offered the choice for local pick.